Next arrived a small square brown box I had not been expecting. About a week ago, I absentmindedly signed up for a giveaway for collection of 12 signed Kitty Norville audio books and guess who won!! 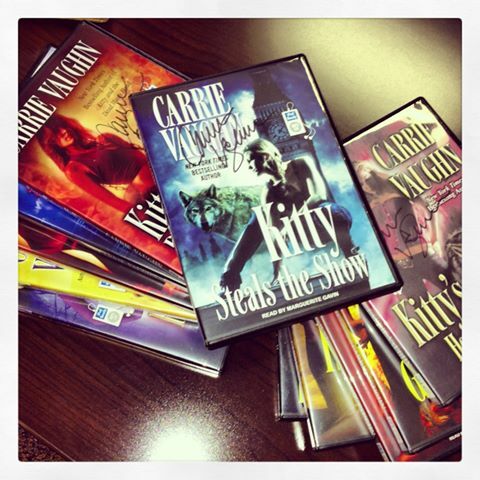 If you don’t know, aren’t a fan of paranormal fiction, or just don’t enjoy reading, Kitty Norville is a book series by Carrie Vaughn about a werewolf named Kitty who hosts a talk radio advice show for the supernaturally disadvantaged. I use reading as a relaxing escape so these are perfect for me! Since I’ve been trying to use my super expensive (and highly underused) gym membership more often and these are my first audio books, I’m really looking forward to loading these to my iPod/iPhone!